My latest column for How To Spend It magazine is a commissioned piece on Pitti Uomo (obviously). I looked at the style of buyers rather than peacocks, and the low winter sun that makes the whole thing so dramatic. Other recent columns for the site considered Alice Made This (our flatmates during Pitti) and a shameless pitch for The Finest Menswear in the World. There will be further pieces in the hard copy of the mag coming up too – on Kaweco fountain pens and the appeal of vintage cigar cases. Look out for them. 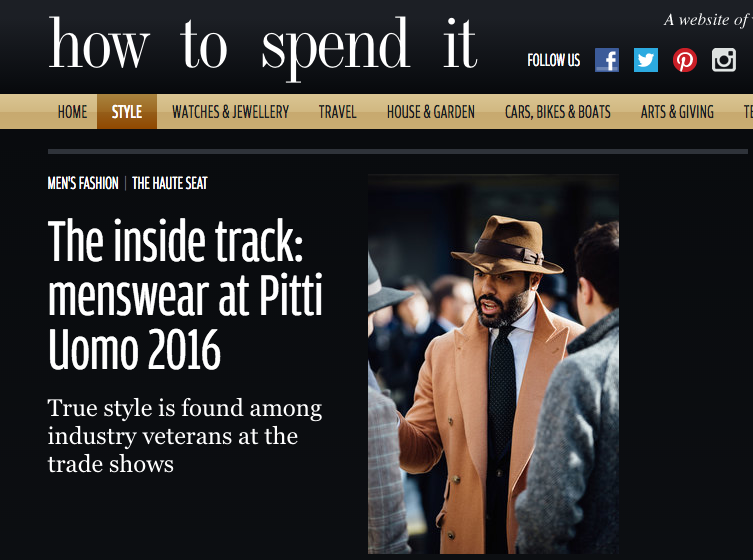 You can follow the discussion on How to Spend It: Buyers’ style at Pitti by entering your email address in the box below. You will then receive an email every time a new comment is added. These will also contain a link to a page where you can stop the alerts, and remove all of your related data from the site.